Heres some of our completed and ongoing projects. 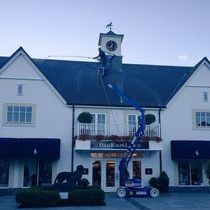 We clean and treat the natural slate roofs throughout Kildare Village keeping them free from moss, algae and lichen growth. Kildare village prides itself on it's impeccable appearance which we've helped to maintain since our establishment in 2011. Apartment complexes, Santry, Co Dublin. 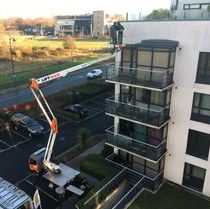 Cleaning of all exterior wall surfaces on three large multi-storey apartment complexes in Dublin. The K-Rend finished walls had become tired over time due to a combination of algae, fungi and some non organic stains. 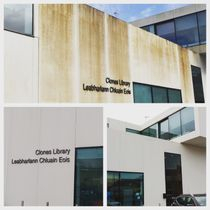 Contracted by Monaghan County Council to treat of some heavily stained Techcrete wall surfaces of the Library building in Clones. Lucan Shopping centre, Lucan, Co. Dublin. 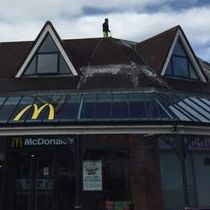 Moss removal and treatment of over 3,ooom² of small concrete tiles on the roof of Lucan Shopping centre. All works were carried out without disruption to the occupants or their customers. St Michaels NS, Limerick City. 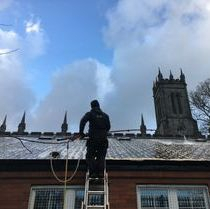 Moss removal and treatment of slate roof of St. Michaels NS in Limerick City. Carton House hotel and golf. Maynooth, Co. Kildare. 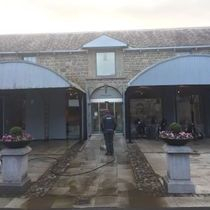 We provide ongoing grounds maintenance works to our clients in Carton House to help keep the hotel and golf club grounds in pristine condition. Greenpark, Dundalk IT, Co Louth. 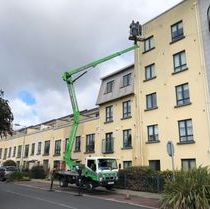 We were contracted to clean and treat the exterior walls of this six story student accommodation apartment complex in Dundalk. 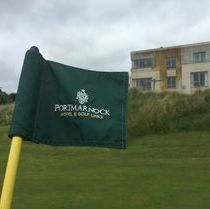 To coincide with some extensive upgrades, we were contracted to clean the entire exterior facade of the Hotel and golf club in Portmarnock. Surfaces included both modern and period building surfaces. 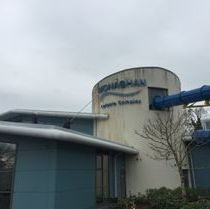 Contracted by Monaghan county council to clean and treat the K-Rend walls and metal cladding of the Leisure complex. 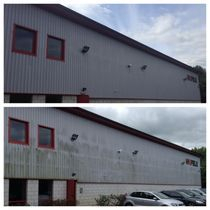 We were contracted to revive the grubby kingspan cladding of the Hafele industrial unit in Wicklow. 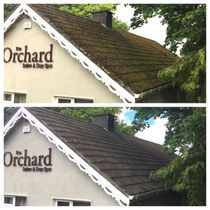 Moss removal and treatment of the Orchard Spa roof, Hotel Kilkenny. Rosconnell Apartments, Newbridge, Co. Kildare. 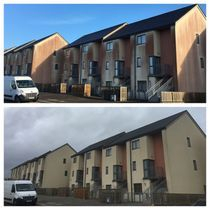 Cleaning and treatment of heavy red algae staining on large K-Rend apartment complexes. 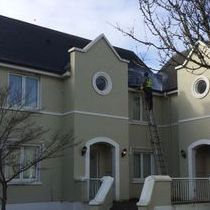 To coincide with the extensive refurbishment of Adare Manor, Softwash exterior cleaning were contracted to clean and treat the roofs, walls and surrounds of the holiday townhouses. 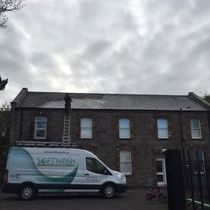 Moss removal and treatment of natural slate roof of Scoil Mobhi in Dublin. 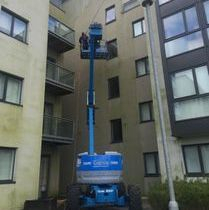 We were contracted by the management company of this large Dublin apartment high level apartment complex. Render wall surfaces with both organic and non organic staining.